This metallic blue Diana F+ Flash from Lomography is a retro-style flash that inherited its design from the original Diana's 1960s design. 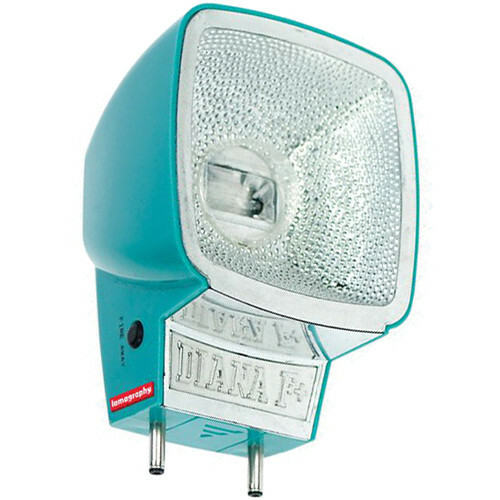 The Diana F+ flash is a designed to be an ideal match for your Diana F+, LC-A and Lubitel 166+ cameras. The flash attaches to your compatible camera via a dual metal-pin attachment, but an included hot-shoe adapter allows it to mount to any hot-shoe camera as well. A glowing ready light lets you know when the flash is recharged, and ten colored gels are included to add color to your flash and your photos. The flash is powered by a single AA battery. Box Dimensions (LxWxH) 5.5 x 3.4 x 2.7"
Diana F+ Flash (Metallic Blue) is rated 4.0 out of 5 by 1. Rated 4 out of 5 by Steve from Love Lomography products This is a great flash.? Comes with 10 gels which alone makes it a great addition to any camera.? You can add a hotshoe attachment.? My only reservation though is that it does not come with a Lomo prong to hot-shoe adapter.? You have to buy the camera with the flash included to get this functionality, you cannot buy the camera and the flash separately.? I just bought a Diana Mini that came with a flash, so I will probably resell this item. Will this flash work with the 35mm Diana camera, or just the 120mm?